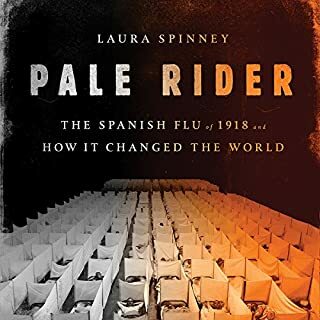 In this gripping narrative history, Laura Spinney traces the overlooked pandemic to reveal how the virus travelled across the globe, exposing mankind's vulnerability and putting our ingenuity to the test. As socially significant as both world wars, the Spanish flu dramatically disrupted - and often permanently altered - global politics, race relations, and family structures while spurring innovation in medicine, religion, and the arts. 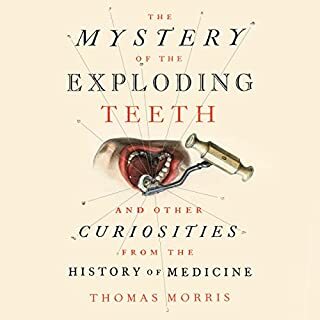 A puzzling series of dental explosions beginning in the 19th century is just one of many strange tales that have long lain undiscovered in the pages of old medical journals. Award-winning medical historian Thomas Morris delivers one of the most remarkable, cringe-inducing collections of stories ever assembled. In 1918, a world war raged, and a lethal strain of influenza circled the globe. In the midst of all this death, a bizarre disease appeared in Europe. Eventually known as encephalitis lethargica, or sleeping sickness, it spread worldwide, leaving millions dead or locked in institutions. Then, in 1927, it disappeared as suddenly as it had arrived. Asleep, set in 1920s and '30s New York, follows a group of neurologists through hospitals and asylums as they try to solve this epidemic and treat its victims - who learned the worst fate was not dying of it, but surviving it. Feeling feverish, tired, or achy? Listening to Gina Kolata's engrossing account of the 1918 Influenza epidemic is sure to give you the chills. A gripping work of science writing, Flu addresses the prospects for a great epidemic recurring, and considers what can be done to prevent it. David Oshinsky, whose last book, Polio: An American Story, was awarded a Pulitzer Prize, chronicles the history of America's oldest hospital and in so doing also charts the rise of New York to the nation's preeminent city, the path of American medicine from butchery and quackery to a professional and scientific endeavor, and the growth of a civic institution. This comprehensive and gripping narrative, which received the 2006 Pulitzer Prize for history, covers all the challenges, characters, and controversies in America's relentless struggle against polio. Funded by philanthropy and grassroots contributions, Salk's killed-virus vaccine (1954) and Sabin's live-virus vaccine (1961) began to eradicate this dreaded disease. In 1918, the world was still in the throes of the Great War, the deadliest conflict in human history at that point, but while World War I would be a catastrophic war surpassed only by World War II, an unprecedented influenza outbreak that same year inflicted casualties that would make both wars pale in comparison. What won't we try in our quest for perfect health, beauty, and the fountain of youth? Well, just imagine a time when doctors prescribed morphine for crying infants. When liquefied gold was touted as immortality in a glass. And when strychnine - yes, that strychnine, the one used in rat poison - was dosed like Viagra. Looking back with fascination, horror, and not a little dash of dark, knowing humor, Quackery recounts the lively, at times unbelievable, history of medical misfires and malpractices. 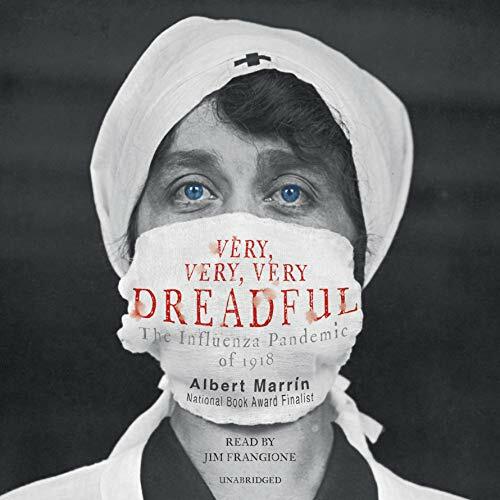 From National Book Award finalist Albert Marrin comes a fascinating look at the history and science of the deadly 1918 flu pandemic - and the chances for another worldwide pandemic. In spring of 1918, World War I was underway, and troops at Fort Riley, Kansas, found themselves felled by influenza. By the summer of 1918, the second wave struck as a highly contagious and lethal epidemic and within weeks exploded into a pandemic, an illness that travels rapidly from one continent to another. It would impact the course of the war, and kill many millions more soldiers than warfare itself. Of all diseases, the 1918 flu was by far the worst that has ever afflicted humankind; not even the Black Death of the Middle Ages comes close in terms of the number of lives it took. No war, no natural disaster, no famine has claimed so many. In the space of 18 months in 1918-1919, about 500 million people - one-third of the global population at the time - came down with influenza. The exact total of lives lost will never be known, but the best estimate is between 50 and 100 million. In this powerful book, nonfiction master Albert Marrin examines the history, science, and impact of this great scourge - and the possibility for another worldwide pandemic today. A Chicago Public Library best book of the year! 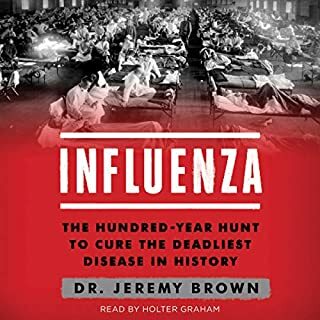 I've read books and seen documentaries in the past about the Influenza Pandemic and always found it fascinating. For some reason, I was in the mood to read more about the subject and this book showed up on Audible as a new release. I like the narrator, Jim Frangione, so I purchased without reading the description in detail. The book started off well but seemed a little simplistic in its explanation of early humans. It became more detailed and specific in the discussion of virus and bacteria but still read like it was written for someone who'd never heard the words before. The same was true about his explanation of World War One. This made me wonder about the author, led me back to the book description in Audible and that is when I noticed the book was written for 11 to 14-year-olds. Explained a lot. It was interesting enough I decided to keep reading and once he started relaying the specifics of this pandemic, where it started, how it spread, how awful contracting the disease was, including personal comments from survivors, family members of those who died, the doctors and nurses who tried to help, the book really picked up. He included extremely graphic and disturbing descriptions of exactly how this flu attacked the body and ultimately killed a person. Far more so than I had read in books written for adults. Gory, but educational. He also touched on how the pandemic affected the war, ultimately becoming a deciding factor, how it was treated and interpreted in countries across the world, not just in North America and Europe, which was very interesting. And most fascinating to me every time I read about it - how it traveled from country to country, continent to continent. He ended with a discussion about what researchers have done in the last 100 years to learn more about this specific virus, what world organizations are involved in the process and how they have used their research to try and minimize flu epidemics we see now. He compared it to more recent viruses such as Bird Flu and finally discussed attempts to recreate a super virus in the lab and how controversial and dangerous that was. My main takeaway was that I was a child of the Cold War. I remember fallout shelters and emergency preparedness drills. But I don't think teachers or parents ever told me in minute detail about the physical effects of radiation poisoning, how it would attack the body, how painful it would be or the true devastation of a nuclear war. I did not grasp how terrible the consequences would be or how close we came to suffering them. If they had, I can't imagine how scared I would have been. 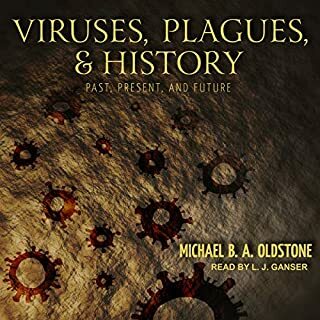 If I was an 11 to 14-year-old reading this book about the horrors of this flu pandemic, the threat, and chances of another pandemic and the fact that we were creating super viruses in labs that were capable of as much devastation, if not more so, I don't think I would sleep at night for months. 11 to 14-year-olds today must be a lot more inured to violent and painful attacks on humans than I was. This book seemed awfully graphic to me for that audience. 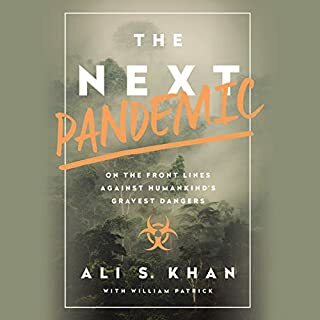 On the other hand, if an adult knows little about this pandemic and wants a brief but substantial overview, this would be a good place to start. The Spanish Flu for the common man. This is gripping backstory to our modern fear of the flu. : Well written and well performed. I felt the gritty horror of WW I that was the pallet on which the Devil Virus painted the macabre tableau of mass death by disease. The science behind is laid bare using common words, skipping the medical jargon. The plot portrays your friends and your family stricken by invisible death in your own home town. 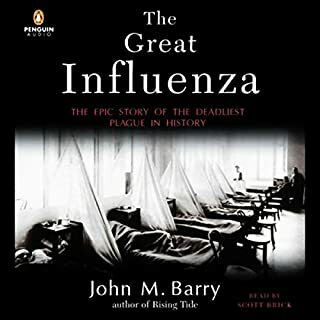 I bought this book because I wanted to learn about the Spanish flu pandemic of 1918-19. I am three hours into this 6hour book and that pandemic has barely been mentioned. Full of fatuous platitudes about gravity, the horrors of war, how loads and loads of people died of flu (well, yes! ), viruses are not the same as bacteria (you don’t say) etc etc. If you need something to help you sleep, in confidence that you won’t miss any important bits- go for it. Otherwise I suggest you look elsewhere. Sorry to be so neg, but annoyed at wasting so much time.